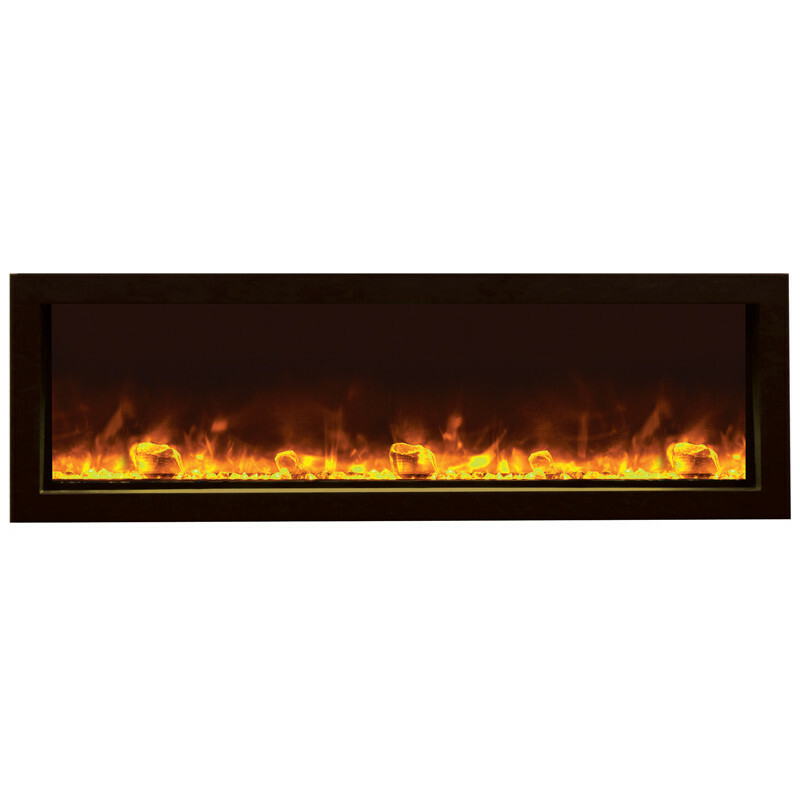 The Amantii 50″ BI-50-SLIM Indoor or Outdoor Electric Fireplace has a High/low 1500W/750W heater with fan. Indoor or outdoor application. Cover must be purchased for outdoor application, call 800-555-0564 to order. Adjustable mood light color. Adjustable flame brightness. Fixed glass front. Heat comes out from the front, below the top trim. Included black steel trim is optional. 2 Year limited manufacturer’s warranty. Part of the Panorama series, this is a modern 50″ wide x 6 3/4″ deep electric fireplace that makes a stunning addition to any space – Indoor or Outdoor – The Panorama Series of built-in electric fireplaces have been designed to give you the maximum in flexibility in selecting a unit that perfectly suits your needs.. This fireplace comes with large glass nuggets, clear & blue diamond decorative media. It also features the vibrant Fire & Ice flame set, which with just a click of your remote, you can easily change the flame color from blue to purple to violet to orange or yellow. The Panorama Series give you multiple length and depth options as well as giving you the ability to install your fireplace with your choice of finishing material built right to the glass for a “clean face” design or using the provided black metal surround.